Tequila? Whiskey? Absinthe? Which is least likely to turn my innards into goo? 1. 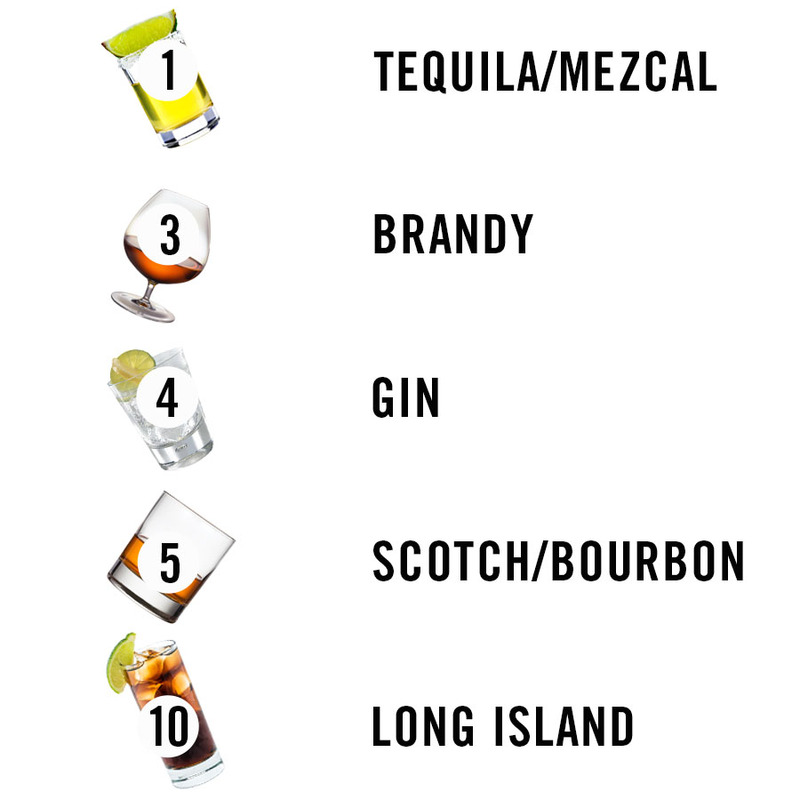 Tequila and Mezcal (tied): “Quality tequila (made from 100-percent agave) comes in at my top pick for the healthiest hard liquor,” Friedman says. “Unlike most other hard liquors, tequila doesn’t spike your blood sugar, which means even people with type 2 diabetes can drink it — in fact, it may even lower glucose levels and increase insulin production.” Tequila is also relatively low in calories. “One shot of tequila contains only 63 calories, compared to the 96 calories in a shot of vodka,” Friedman says. Tequila is also one of the more gut-friendly hard liquors, according to Friedman, since it contains dietary fiber and probiotics (although both studies and experts emphasize that tequila is absolutely not a good source of probiotics). “Tequila also contains fructans, which have potent immune-boosting properties,” Friedman explains, adding that fructans have been developed into drug-carriers that help treat various colon diseases. Friedman also mentions that tequila is gluten-free, since it contains no wheat or barley. Tell that to my Goddamn brain on Saturday morning. “Vodka is also heart-healthy and may help lower cholesterol,” Friedman continues. “Additionally, if you suffer from bad breath, try swishing a shot of vodka in your mouth each morning, since it kills the bacteria that causes bad breath — just don’t get pulled over by a cop on your way to work.” If you say so! “Long Island Iced Teas have a sweet ‘tea-like’ flavor that’s known for going down easy; however, they can come back up just as easy, so make sure to have a pillow on standby for your knees during the inevitable prayer-and-puke time at the porcelain king,” Friedman says. On a final note, I once again want to emphasize that consuming any alcohol in excess is bad for you, whatever other small bonuses your drink of choice may offer. And remember: If you think ditching hard liquor for beer will help you drink less, you’re sadly mistaken. Now please excuse me while I sip a very small, healthy tequila.